Joining a clinical trial should be considered as another treatment option for multiple myeloma. Clinical trials are necessary for new medicines to be approved by the US Food and Drug Administration (FDA). They have played a major role in advancing the treatment of multiple myeloma, and without these trials and the patients who voluntarily participated in them, we would not have the treatment options we have today. When you participate in a clinical trial, you add to the knowledge about cancer and help improve cancer care. It is through clinical trials that researchers can determine whether new treatments are safe and effective and work better than current treatments. Why Does It Matter Who Joins a Clinical Trial? African Americans make up almost a quarter of people living with multiple myeloma today. 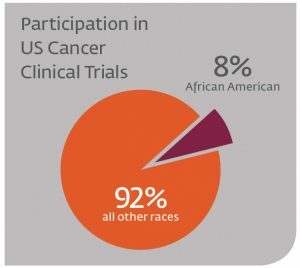 Yet only 8% of patients in cancer clinical trials are African Americans. Therefore, it is important that they are represented in clinical trials to better understand and address the needs of African Americans. What Should I Know About Joining a Clinical Trial? There are both benefits and risks to clinical trial participation. You can talk to your doctor to learn more. People who participate in clinical trials for a cancer drug will always receive at least a current standard treatment or the new drug being studied. You are free to quit the trial at any time if you experience unwanted side effects, if the treatment is not working for you, or for any reason at all. If early results show that one group being studied is seeing a clear, significant benefit over the other group, the researchers will stop the study so that all volunteers can receive the better treatment. To learn more about clinical trials and how they work, watch the Understanding Clinical Trials video presented by Dr. Craig Cole. To search for multiple myeloma clinical trials, visit the Multiple Myeloma Research Foundation Clinical Trials Finder.